This was the first time I felt so nervous since my debut match. There were too many minor mistakes. I am slightly dazed but still feeling great at the same time. You were very aggressive right from the first set so was there a reason? I watched every VOD of Innovation that was available and he seemed to play standard every time. I found gaps in such play. Zerg always gets ahead if both players are greedy so I planned to set up a strong economy early on and use it to strike my opponent. As long as I chose the right timing, I was convinced I would get ahead with my superior supply. The build I used in Set 1 was designed to counter a quick expansion by Innovation. It's a build HyuN used to use but I altered it slightly to suit my style. I was supposed to take out the siege tanks with the Broodlords but Innovation saw through my play and took them out. I was very ahead but nerves got the better of me. In Set 2 on Neo Planet S, you used a strategy similar to the one in Set 1. This map is known for the roach/infestor aggression lately so what was your rationale for choosing the strategy? Neo Planet S has no watchtowers. This means a Zerg can spread creep at an uncontrollable rate. This strategy counters not only bio but also mech. When I saw that Innovation had a bio composition, I chose banelings instead of infestors. I was convinced I could win in a battle of attrition. Did you expect Banshees in Set 3? Not at all. I saw three dots on the minimap and assumed they were medivacs. So I made some banelings and lo and behold, flying menaces in my base. Then again, I was going to attack into him even if he were macroing up. I used a roach/ling/bling attack but at the time, I was fine with it being defended and not doing any actual damage. As planned, I spread creep to my opponent's third base location and normally, no one scouts this area. However, Innovation did. From then on, I was behind. I chose an all-in strategy and Innovation countered perfectly with a macro strategy. It was very hard to catch up from there. I tried macroing on the map and it never worked well for me. That's why I chose an all-in. I watched every single VOD played on Icarus. I saw True on Team 8 use the Nydus Worm. So I copied it straight away and no Terran was able to hold it. Normally, no one has marines on the low ground but Innovation seems to have expected my strategy and had marines ready. Even so, I was sure I would break through. This is strategy is foolproof. Even if the Terran counters it all out, they lose SCVs and they have a hard time in the late game. Who do you want to face in the next round? I don't really mind. I think a Protoss would be good for putting on good games. You recently joined your team's training house. How is the atmosphere? We got close very quickly. I didn't know too many hyungs (T/N: respectful term for older male used by younger males) in my old team but they're all nice to me so it's no problem getting to know them. Also, everyone is playing HotS now so it's kind of difficult to ask for practice on WoL when I'm the only one playing it. Well, what could I do. I wanted to win my games so I asked for practice nonetheless and they were more than willing to help me out. I haven't played it myself but I watch VODs and streams to get an idea. Defintely, ZvT looks difficult. Zerglins are supposed to surround the enemy's army while on creep but Hellbats negate that completely. Medivac Boost needs changes also. How likely do you think it is that you win the whole season? I haven't thought about that yet. I was hoping desperately to get past RO8. Really not sure yet. I will try my best. I asked Coach Iris for a favour because I wanted to get to the studio early today. I want to thank him for dropping me off so early even though he is very busy. I want to thank my teammates and Center on Quantic who helped me practise even though they are busy switching to HotS. Also, former TSL Zergs gave me so much help. I can't express how grateful I am. I also want to thank True who showed me the solution to Icarus. I am not happy with my play which has too many mistakes arising from nerves. I promise to show better form in RO4. You have succeeded in advancing from RO8 to RO4. How does it feel to beat your PB? Fantastic. PartinG told me that he would stop me but I was confident that wouldn't happen. I didn't get to show all of them but I have several very strong ZvP strategies. Your play was full of ambition and resilience. What was your focus? Lately, the age of infestors had ended in ZvP. So I focused on the Mutalisk. I became convinced during practice that I could take the win today. I almost never lost in practice. I should have ended it with 3-3 upgraded Broodlords, Corruptors and Infestors. However, I somehow screwed up my army composition and did not have enough corruptors while maxed out. My attack was defended due to that mistake but I abused the map to my advantage. I believe that was the best way for me to win. 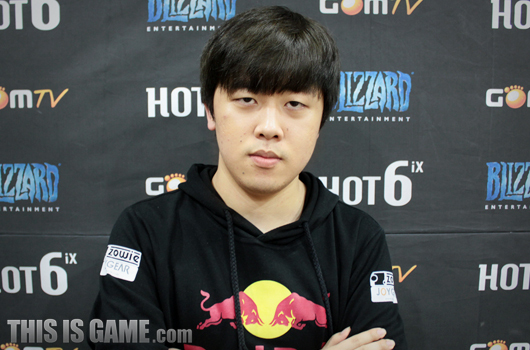 PartinG likes to go nexus first without scouting so I had a strategy prepared for that. However, I saw him scout with a probe. I used that again him. That convinced me that he was going double nexus and took control of the game with Mutalisks. There was nothing PartinG could have done at the point to scare me. Life had a big impact on me. Seeing him use Hydras in tournament games was so cool so I asked him to teach me. Hydra builds can be countered heavily so I had it saved for one set only. Did you expect a 3:0 victory? Yes. If I took the first set, 3:0, if not, 3:1. So far, Symbol has been doing better than me but as those who have smashed their own limitations, I hope we can put on great games. I hope whoever wins out of us goes on to win the whole season as an ESF Zerg representative. Not that I plan on losing to give him that chance. Was it difficult to prepare for ZvP? I found it difficult at first but I eventually figured it out. Teammates were also a lot of help. I think that's when my ZvP started improving. I actually lost a lot on the ladder trying to keep my strategies hidden. However, I wasn't worried at all since I had my cards ready. I don't really distinguish between the two. Not that KeSPA players are lower class or anything but I do wish ESF players stepped it up a bit. How far will the Code S reader advance? I want to thank the sponsors Red Bull, Zowie and Joy Gear. I owe today's victory to Life, Avenge and Panic. FXOTear and LG-IM Younghwa also helped out a lot. I would like to thank PartinG for today's match. Symbol's nydus play was pretty strong but I feel like he basically told terran players it's going to happen to them when he plays on that map. 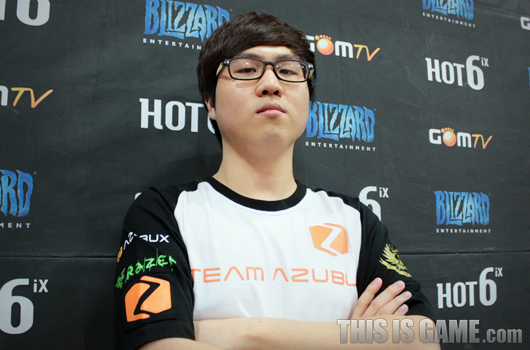 We shall see if he ends up playing Taeja. really looking forward to curious interview translation! he just swept over parting like it was nothing, really impressive. Good interview from Symbol with interesting insights of his build orders and how they were supposed to work on the played maps. Thanks for the interview, obviously looking forward to Curious' interview! CURIOUS!!! From Round of 16 to ROUND OF 4 ALL AT ONCE BABY!!! Such dominating play against the Money Man! Never went away. Seeker and Wozzot have a stranglehold on the interview translating business though haha. Haha, Curious being so badass now. I hope he gets past Symbol and the would-be finalist and actually claims his first championship. He's suffered for too long now. Ha, right after the Seeker and Wozzot alliance, storywriter pops in and robs'em blind. Man I'm happy for Curious and Symbol, they've deserved a semi-final for so long. Curious as confident as he should be. Just hoping it won't turn into overconfidence and effect his gameplay negatively. Did you have to pay some protection money to be allowed to write the translation for once? Plays memorable games (for good or bad ie Curious v Creator on Cloud Kingdom BL/Infestor/Spine v Carriers) and noone ever roots for them.